Performing an eyelash extension procedure requires patience and skill. It is good for beauty professionals to practice quite a bit before attempting the procedure. While the initial technique is fairly easy to learn, perfecting the technique so that the extensions are properly bonded to the natural lashes and so that it is as efficient as possible requires some investment of time and effort. Many product suppliers offer DVD training augmented by hands-on workshops. The procedure itself, however, is fairly straightforward. Each eyelash extension is made from a soft synthetic material and looks almost identical to the natural lash. Each lash extension should be placed individually. This requires a precise touch and patience. A full application can take an hour to an hour and a half. The use of tweezers can aid this process, and make it more sanitary to the client. Because each extension is bonded to a natural lash, and not the eyelid, they remain in place as long as the natural lash remains. Some suppliers, like 3d-beauty.com, offer eyelash extensions that are treated with a special primer that helps strengthen the bond and protects the extensions. When you are ready to place the extensions, it is important to make sure that you are working in a clean environment. Prepare the client by making sure that her or his eyes are free from makeup and oil-based skin care products. The lashes especially should be clean. Place the lash extensions that you need on a large makeup sponge that can serve as a palette. Make sure they are separated and easy to pick up using your tweezers. It is a good idea to wear gloves throughout the eyelash extension procedure. Having the separated and easy to see allows you to make sure that the extensions are within easy reach. It also looks professional and well laid out. Before beginning, pour a small amount of your eyelash extension adhesive into an adhesive holder. Many suppliers, including 3d-beauty.com, provide special adhesive holder. This makes the process much easier, as you will not have to try to get a little out of the storage bottle for each extension. It is easy to get to, and disposable adhesive holders ensure a clean environment. The end of the lash extension that attaches to the natural eyelash should be carefully coated with adhesive and then placed on top of the chosen lash. Using your tweezers to accomplish this increases the precision with which you can place the eyelash extension. It takes no more than ten seconds for the bonding adhesive to dry on each lash, so it is important to become practiced at placing the extensions. If you make a mistake, make sure that there is some remover handy so that you can remove and discard the offending extension. Once the bond is made, the lash extensions will resist the effects of tears, sweat, water, and sun. Make sure, however, to warn the client to avoid water for at least two hours after the procedure. After that, it is even possible to go swimming while wearing eyelash extensions. 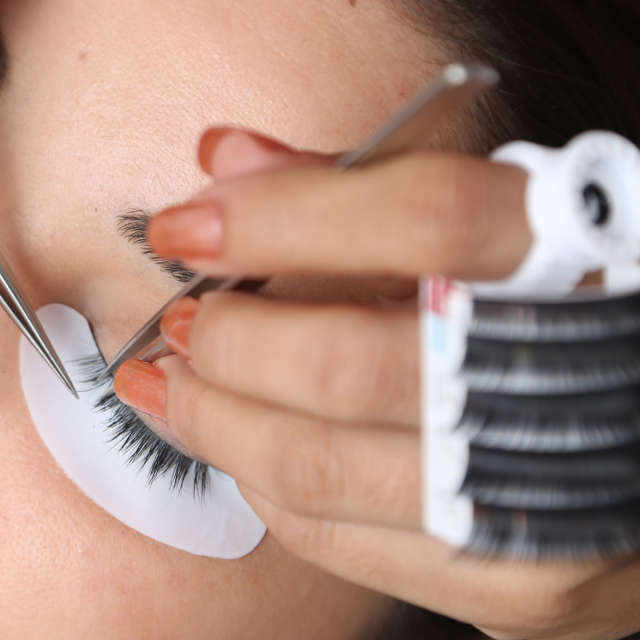 It takes no more than ten seconds for the bonding adhesive to dry on each lash, so it is important to become practiced at placing the extensions.